I am NOT a shotgun guy. I did not grow up shooting clays or hunting fowl. I do not live in an area with large enough dangerous wildlife to warrant carrying a shotgun in the wilderness. If I did, I have plenty of smaller, lighter, options in firearms to carry into the woods that would do just as well or better against dangerous wildlife. As for home defense, there is an AR next to my bed. So why am I talking about shotguns? When I ask people what gun they have the most training with, almost every person I ask says it is their carry pistol. When I ask what gun they would most like to have with them in their ‘SHTF’ fantasy, most say it is their carbine. It baffles me that the person who has said that they have most of their training on a pistol, and are most comfortable with a carbine STILL selects option C.
Option C, the option that is empty the fastest and slowest to reload. The option with the slowest shot to shot recovery. The option that has the least amount of compatible training with other platforms. The option with the most expensive training ammo. The option with the least light and optics compatibility. The option that is far too long to pie corners in most homes’ cramped hallways. Now you know where I stand in the shotgun debate. Let me talk about why I still own one and where I use it. Shotguns are CHEAP. 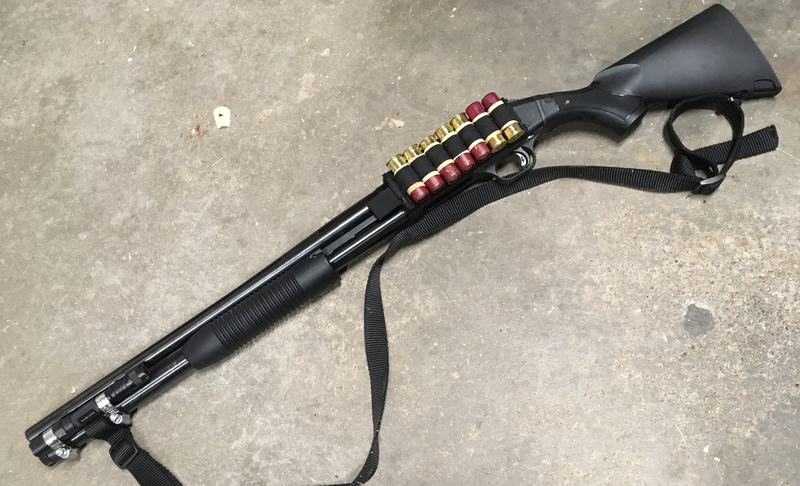 Pump shotguns, specifically, are the best combination of dirt cheap, durable, reliable, and simple maintenance for any application where a gun needs to be staged in less than ideal conditions. You are more likely to use the thing as a tool if you can afford to replace it. I can easily reason that when it comes to getting a shotgun wet, banged up, dragged in dirt, etc, for DAILY use it bothers me much less to do so with a shotgun than if I had to do the same with my carry pistols and carbines. I have plenty of tools in my garage that are worth more than my ‘beater pump’. This means that the crappy pump gun can go on ALL journeys with me. My truck gun of choice is the beater pump. Its general shape lends to easier storage in all the vehicles I have owned. Its cheap cost makes it an easy write off if the vehicle is destroyed, or worse… stolen. If stolen; better to lose a bare bones, Walmart variety, pump gun than an expensive carbine and all the accessories attached to it. For defensive encounters on the road, the 12g pump gun can be loaded to perform well for anything you are likely to encounter in the US (More on how I prefer to load that pump later). I have options for precise shots to 100yd, or tight buckshot spread out to 50yd. Both options will have plenty of energy on target after passing through a car door and/or auto glass. If I throw in a box of cheap #7 birdshot next to that gun, I now have an option to take some small game when I am out camping. Did I mention that they are cheap enough to buy one for every vehicle and still be below the cost of a single carbine with an optic? My trail gun of choice is… an AR, but my second choice is my beater pump. Why? I know that I will be able to ‘lay down some hurt’ most effectively with my AR. Often, that is not the primary concern. Often times, I want to have a long gun, but not scare/piss off the local hippies on the trails I backpack on. Shotguns are a more comfortable sight than black rifles. Many people will argue against this, spitting out some cliché BS about the sound of racking a pump making bad guys wet their beds in the next county. (If you are that guy, I want to let you know that every time you have gone there, you lost all credibility as a shooter and ‘defense tactician’…) People are more comfortable seeing another person with a shotgun vs a carbine because there is so much exposure to the stereotype of ‘Bob the American hunter’ with a long gun over his shoulder (no scary protruding magazine), hiking fields, repairing fences, defending his home from Grizzlies. It is viewed more as a tool of food acquisition than a tool of war. It is because of this IMO that I get far fewer dirty/concerned looks from passing hikers when I have my shotgun slung over shoulder vs. when I have a light pack carbine. That’s it. That is what it’s good for. A disposable truck gun. A PC-ish trail gun. Here’s how I load it. A tube full of Federal Flite Control 00buck and a side-saddle full of Federal Truball Deep Penetrator 1oz slugs is what I recommend. Flite Control 00buck will work just as well on the bad guy hiding behind his car door 25yds away as it will on the downed animal in the middle of the highway, needing to be put down. It will also hold a man-sized pattern out to 50yds in my 20″ cylinder bore tube. For reference, The Walmart brand ‘military 00buck’ holds the same man-sized group at only 12yds out of the same gun. The standard rule for spread is 1″ of spread for every 1yd of distance out of any cylinder bore tube. Federal Flite Control does significantly better than standard. As for the side-saddle full of slugs, I want to be clear; ALL SLUGS ARE NOT THE SAME. The standard variety 1oz foster slug you see on most shelves in the sporting goods stores are meant for game no larger than a person. In gel, a 1oz foster slug will only get 14″ of penetration. This is devastating on soft targets like people and worthless on hard targets like angry moose, grizzly bear, or people behind cover (cars/walls). Targets with large body mass and thick hide will need something with more penetration. Brenneke slugs are what is typically recommended, but Federal’s new hardened Truball Deep Penetrator offers similar penetration at half the price. Folks at Federal, if you are reading- Please send me free stuff. I will continue to recommend your products. Oh yeah, the beater pump also sports an old model Fenix LD20 attached with Home Depot’s finest tube clamps. The mount has around 500 shells on it with no issues. Cheap. Effective. NOT high speed. I find no worthwhile defensive use for the shotgun outside of the roles of truck gun and trail gun. This is especially true in the new world of $400 ARs. If prices on ARs drop much further, I may only hold a scatter gun for one season a year, and only in the hopes that I can put some small game in the freezer. Thanks for the read!